Whether you’ve been exercising for years or are just starting a fitness program, it’s always important to pay attention to your body and avoid any possible injuries. This way you can stay on track and keep moving closer to your health and fitness goals. NO PAIN, NO gain. Forget it! Believe it or not, that saying doesn’t apply when it comes to exercise. The goal should always be to stay healthy and injury free. And for that reason, today we are going to look at some common injuries and share with you tips and suggestions on how to keep the body healthy as well as ways to quickly bounce back from the most common Injuries and pain. Injury possibilities largely depend on the choice of exercise, but there are a few areas of our body that are more prone to injury than others. This is a big one. Many people have weak back muscles due to prolonged sitting at work or at home. In our last episode we talked about all the negative implications of a sedentary lifestyle. Now imagine this: Someone is sitting throughout the day with a rounded upper back, their head extended forward all while staring into a computer screen. After 8 hours of this they go to the gym and without a proper warm up or corrective mobility exercises they just hit the workout hard, right from the start. Now this is purely a recipe for disaster. Prevention: Remember to open up, mobilize, stretch and strengthen your upper back to compensate for all that sitting you do at the office/home/car. Find alternate ways to sit watch here. Always lift using your legs, not your back! Gradually strengthen your back muscles with safe low intensity exercises. The shoulder joint allows for a large range of motion and is (directly or indirectly) involved in most of our day to day tasks and movements. Also it’s helpful to know that the shoulder is not a single joint, but a complex arrangement of bones, ligaments, muscles, and tendons that (if not taking care of properly) is often prone to all kinds of injuries – either due to overuse and/or poor posture/technique. Prevention: Do not push through pain—let your shoulder rest—and strengthen your shoulders with basic exercises such as wall push-ups, scapular push-ups, and mobilize the area performing shoulder pass throughs using elastic bands. Be aware of keeping good posture (a slouched posture makes you more prone to injury) and avoid repetitive overhead exercises with weight that’s too heavy for you. Frequently give your shoulders much deserved love by incorporating one of our “shoulder mobility sessions”. It’s easy to take our knees for granted. They support our entire body and allow us to take thousands of steps every day. And yes, the knees are designed to remain stable and healthy. However, as with any other part of the body, things can go wrong. 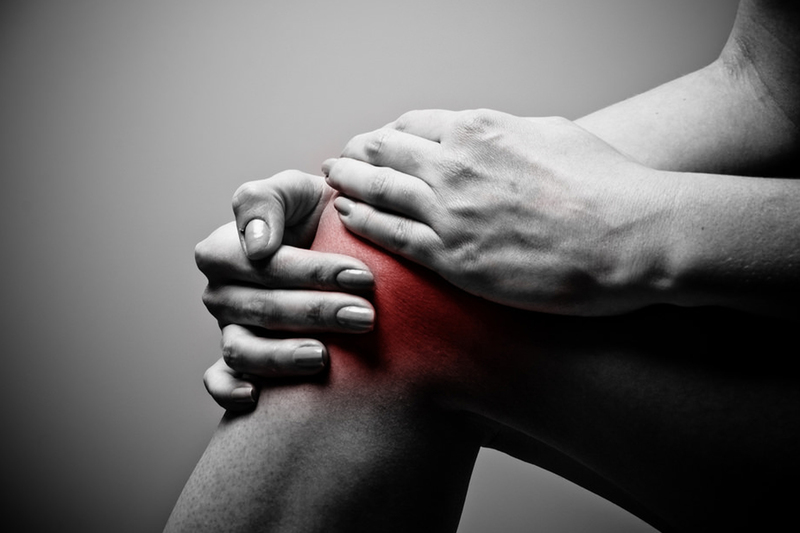 Pain under the kneecap that worsens from running, walking down stairs or sitting with bent knees for long periods of time could be a sign of patellofemoral syndrome, also known as “runner’s knee”. You may also hear a crunching, creaking or grating sound coming from that area. Patellofemoral syndrome occurs when the bones in the lower leg are not lined up perfectly, which causes an abnormal gliding between the patella (kneecap) and femur (thigh bone). This misalignment can lead to wear and tear between the cartilage and surfaces of the bones, causing pain and discomfort. Prevention: To keep our knees healthy it’s important that we minimize the stress we put them under every single day. It’s possible to prevent, avoid and treat a knee injury by focusing on improving the imbalances in our lower body. Strengthen your quadriceps and glutes, mobilize your hips, open up your hamstrings, and exercise your feet. These are all important aspects that will take away necessary stress from knees. Also include unilateral exercises (one leg at a time) to decrease strength imbalances between right and left legs. Whenever kneeling on the ground support your knees with extra padding (yoga mat, blanket, etc). Your shins have to bear up to 6 times your weight while you exercise, so foot-pounding activities like walking and running (especially on the pavement) can cause problems for the muscles and surrounding tissues and furthermore create inflammation. This is an injury that often effects people who are new or just getting back to regular exercise. Prevention: Make sure you choose proper footwear and avoid a sudden increase in your exercise regime, instead work on gradually increasing your distance/time and speed and paying attention to how your body reacts. As far as treatment goes, the pain caused by shin splints can be treated like most other injuries. You can use ice packs to reduce any swelling or to calm inflammation. Applying an ice pack for 20 minutes every 2-4 hours should give you some relief. You’ll probably also need to give your legs a rest, so they have time to recover. Yet it’s also just as easy to sprain your ankle by stepping off a curb the wrong way or taking a walk on the beach. Sprains most commonly occur on the outside of the ankle when you “roll” your foot. This causes the ligament on the outside of your ankle to stretch more than it is able to. Prevention: Start with choosing a proper shoe. You should look for a running shoe that isn’t too high in the heel, this will help spread the impact to the whole foot and help prevent many other issues related to your feet like plantar fasciitis, achilles tendonitis and bunions. For more info on how to chose the right shoe as well as ways to strengthen your feet and prevent injuries watch this video. A Hamstring injury is fairy common in sports. Hamstring injuries are sometimes known as a ‘pulled Hamstring’. The term ‘pulled muscle’ comes from the description of how the injury takes place. Usually, the Hamstring muscle is forcibly stretched beyond its limits and the muscle tissue becomes torn. Prevention: It goes without saying that a good warm-up is imperative. If you want to avoid any hamstring problems, introduce strengthening exercises to your routine, for example single leg deadlifts, squats and lunges. Make sure to work on flexibility and mobility of not only the hamstrings but also the glutes and hips – our mobility and yoga sessions are an excellent choice for this. 1. Don’t ignore an injury! Often we feel that if we don’t do anything, skip exercise and rest, it will get better on its own. But that is a big mistake! If you don’t do anything to promote healing, it can get much worse. Your body will compensate and what started as pain in the knee, could lead to a sore back, aching shoulder or recurring headaches. Get a professional diagnosis. Depending on the type of pain or injury, consult your doctor, physiotherapist, chiropractor or massage therapist. Get their okay to carry on with regular exercise or ask for suggestions on how to heal. A good therapist should not only help ease the pain but also provide a solution to strengthen any weak areas and prevent further troubles. It might also be a good idea to hire a personal trainer, so he or she can observe your form while exercising. And yes, we are even talking about walking! You would be surprised by how many people don’t walk correctly, causing more harm than good. While overcoming and injury it’s more important than ever to properly nourish your body. That means staying away from processed foods, fast food, packaged food, anything containing sugar and artificial sweeteners, including regular and diet soda or pop. All these foods will cause unnecessary inflammation in the body, which will prevent healing from taking place. Instead, focus on eating fresh, preferably organic vegetables, fruits and whole sprouted grains. Don’t forget to include plenty of healthy fats such as flax oil, hemp oil, extra virgin olive oil, avocado and soaked nuts and seeds. Stay hydrated with clean, fresh water or try our Recovery Drink. Rather than relying on anti-inflammatory drugs such as Advil or Motrin, consider trying one of these herbs: turmeric, ginger and bromeliad (not an herb, but an enzyme found in pineapple). All these have been known for centuries to be the most powerful natural healers. One of the worst things you can do when you get hurt is to completely eliminate all physical activity. Resting the affected area and proper sleep are crucial to a good recovery. But this doesn’t mean that you need to become a couch potato. Unless you are in a body cast or lying in a hospital bed, there is absolutely no reason why you can’t work around an injury. Perhaps you have been given some exercises by your physical therapist. If so, make sure you do them. If you are part of our AV Coaching group follow our mobility sessions, do what you can to stay active. No matter what, don’t give up!